When I first heard about Apple’s recent developments I was so excited. Today I’m less so, much less so. If you hadn’t heard Apple just released a new set of programs/applications, one called iBooks 2 and the other called Author. The two seem to be designed to work together – not surprising considering their source – and both promise to revolutionize the publishing industry and education. Coming from almost any other company no one would believe such a claim but this is Apple. 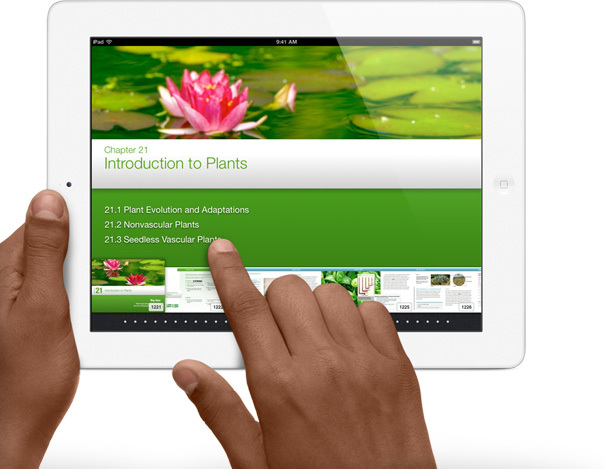 In a nutshell, Author allows you to create a textbook using widgets that combine text, video, graphics and animation to present information to students and iBooks 2 is where you can market them. Currently there are 8 books featured, all science text covering biology, chemistry, etc..
A textbooks on the iPad. Here’s the deal, it turns out that Apple does want to change the publishing business and the way we educate children. They also want to completely control the process soup to nuts. This has always been the problem with the company, they love the walled garden. 1) iBooks 2 and Author can only be used on the iPad; 2) Apple determines what can and can’t be sold or given away; and 3) If determined unsuitable, the proposed textbook can’t be published anywhere else unless changed/redesigned. Locking users into purchasing an iPad is at least understandable, after all Apple is a for-profit company. I totally get that. You can make the argument however that because Apple is trying to exploit the public education system they might have to compromise and at the very least make the applications available on other less expensive devices. The thing I find so odious is the company’s attempt at total control of the product, specifically content, and its draconian demands about who and when a textbook can be used. This clearly wasn’t and isn’t the case with iTunes. iTunes completely revolutionized the music industry in how it paid artists, sold music (individual tracks instead of albums) and marketed podcast, songs, movies and other digital media products. No where in the course of iTunes development or implementation did Apple demand control of music or podcast content. Granted they would label certain tracks explicit but that has been common practice within the music industry for decades. This week’s TWIT podcast (sorry Leo, netcast) really does a great job in covering the issue and I suggest everyone check it out. Guest included Cali Lewis, Ed Bott, Mike Elgan, and Patrick Norton. Personally, I appreciate Bott’s argument although Mike Elgan made a few good points. Consensus seems to be that the marketplace will ultimately determine the issue but I’m not sure. As the 800 lbs. gorilla in the tablet market, Apple plays a leading role in its development and we all know how well they play with others. As an Apple fanboy it is the one thing that hacks me off the most. In the end I’m hopeful about what is going on with these new announcements and applications but I’m apprehensive about what will happen. At the very least change is coming.